To the uninitiated, improving that square of green out the window is an intimidating prospect, here’s some lawn care for beginners. The key for the beginner is to take a breath, put down the pump action sprayer (whatever that does) and focus on mastering the basics. If you weren’t born with a green thumb or if your summer job was more lemonade stand than mower service here are a few basic rules to follow to get that lawn looking lush in no time. Make your mower your friend. Three mowing factors to consider are: your equipment, lawn height and mowing frequency. Sharp mower blades are vital to a cleanly cut lawn. Dull blades will only lead to the leaf blade being torn rather than cut which is unhealthy for your grass and ugly to look at. A trip to your local mower shop once a year for a total check up of your mower and its blades will put you in good stead. As tempting as it may be to avoid that extra Sunday mow, cutting your lawn as close to the ground as possible will cause stress to your lawn. A general rule is to never mow more than one third of the blade length at a time. In summer many lawn types will require more frequent mowing, so sunscreen, hat and protective footwear is a must! Taking care to water your lawn correctly will pay dividends to the long term health and appearance of your lawn. Investing a little extra in a sprinkler and soaker hose will give you an advantage in completing a consistent and deep watering session every time. Rainwater goes a long way to assist in watering, so often your lawn only needs watering in dryer and hotter periods. If your lawn is looking like it needs hydrating it’s best to water in the morning or early afternoon for up to an hour. Watering for longer periods less frequently encourages drought tolerance, avoids over-saturation and is better for the environment. 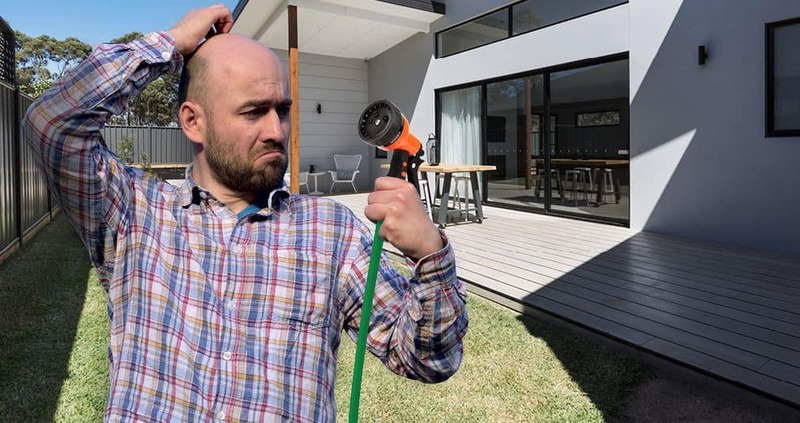 It’s always important to check to the water restrictions in your area and follow those first. A search online is an easy way to identify which weeds you have. Our weeds section is also a good place to start. Depending on the weed it may be best to carefully remove the weed by hand (taking care not to spread the seeds) or using a selective herbicide to coat the leaves. Before applying herbicides make sure to read the label and target only the weed itself. Grass varieties can either be cool season or warm season- which means they grow in either the warm or the cool months. If you decide to boost your lawn with fertiliser it’s best to apply it during your lawns growing period. Check the care instructions as some fertilisers require much more watering in than others. Consider picking up a spreader, this will be a more accurate (and faster!) method than spreading fertiliser by hand. Loving your lawn is easy when you know how. With a small investment in time and research you too can achieve a beautiful lawn to be proud of.